Why do I get constipated before menses? A week before I get my period, I get constipated. However it disappears when menstruation occurs. What could be the reason? And how do I tackle this? Hormonal levels keep on fluctuating during the menstrual cycle. Constipation is just one of those long list of symptoms experienced during PMS. A few days before the onset of menstruation, there is a sudden surge in the hormone progesterone which rapidly falls as soon as the menstrual flow commences. Progesterone is a muscle relaxant. High levels of progesterone relaxes the muscles of the intestine, making it difficult to move the the stools and other waste products outward and hence causes constipation. With the fall in progesterone, the muscles of he colon are no longer affected by it and there is an increase in bowel activity, which is why your constipation resolves itself as soon as the menstruation starts. However not all menstruating women experience this. Constipation is also experienced by some pregnant women, due to this very reason - the increased production of the hormone progesterone during pregnancy. Now if you have never had this 'constipation before menses' problem, but are experiencing it recently, be aware that certain medications also tend to disturb the pattern of your menstrual cycle. If you are on contraceptive pill or if you have been taking fertility drugs /injections to conceive, then this too can have an effect on your cycle which in turn can affect your bowel movements too. 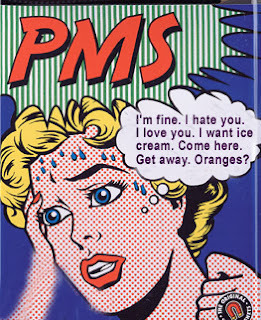 Also with age,not only the pattern of your cycle but your PMS symptoms will also vary. As long as your bowel movements resume to normal with the beginning of the menstrual flow, it isn't such a cause for worry. Also in the later half of the menstrual cycle, your serotonin levels decrease and to compensate for that, you get food cravings, particularly the sugar and carbohydrate variety. So if you gorge on such carbohydrate rich food or junk food to satisfy your urges you are prone to constipation as these foods are known to cause bloating and constipation. You can't pretty much do anything about those hormonal fluctuations but you can minimize the symptoms to a great extent with right food choices and exercise. You have to be particularly alert about your diet during the second half of your cycle. Eat lots of fibrous food, particularly green veggies and fruits. (If you don't like veggies here's a post on how to sneak veggies into meals without tasting them.) Try and minimize the consumption of non-veg food, particularly avoid red meat during that period and go slow on dairy products. Consume lots of water and fluids. Exercise regularly. Exercise can help with bowel movements. Yoga poses such as Baddha Konasana, Butterfly pose (Titli Asana), Surya Namaskar (Sun salutation Pose) and other poses mentioned in Home Remedies for PMS will help. You may also try brisk walking. Practise of Pranayam breathing exercises such as Anulom Vilom, Bhramari & Kapalabhati will also help. A combination of yoga poses, pranayama and meditation can boost your serotonin levels and also minimize the symptoms of hormonal variations. If your constipation is severe and the above remedies don't seem to help much then go to your obstetrician / gynaecologist. He / She will carefully evaluate your situation and may prescribe a mild laxative to tackle this problem. Usually when you have your period, some chemical gives some people diarrhea, so maybe if you're constipated, that's why it relieves it. This happens to me every I get my period. What I do is watch my diet during my period and I try not to eat any cereal or bread, and any type of junk food. I also drink a lot of water and juice, but what helps me the most is eating really healthy a few days before my period starts until it ends. You get constipated because of hormones. When it is time for your period start loading up on fibers and drink alot of water. It is normal and ok so don't worry. increase your fibre intake is the best thing for constipation and that means wholemeal bread, high fiber cereals and plenty of fruit and vegetables. Of course the best thing to do (and you probably know this already!) is to try and modify your diet so that you don't get constipated.